Angelo Scola (born in Malgrate, Lombardy, Italy) is a famous Clergyman from Italy, he is 77 years old and still alive, born November 7, 1941. Angelo Scola is cardinal in the Roman Catholic Church and Archbishop of Milan. Previously, he was Patriarch of Venice. Scola studied Catholic theology and philosophy in Milan and Fribourg (Switzerland), and received his doctorate in both subjects. He was ordained in 1970, and studied further in Monaco and Paris, while he was active in the Italian edition of the newspaper Rivista Internazionale Communio. Between 1979 and 1982 he was a scientific assistant at the theological school in Freiburg, first by learning the chair of political philosophy, later learning chair of moral theology. From 1982 to 1991 he worked as professor of theological anthropology at the Pontifical Institute for marriage and family studies, and the Lateran University in Rome. At the same time, he taught Christology. From 1987 he was secretary of the seventh world Synod of Bishops. Scola was ordained in 1991 and was for four years bishop of Grosseto. In 1995 he came back as bishop of Grosseto and was president of the Pontifical Institute for marriage and family studies. He was Patriarch of Venice, when he was Archbishop of Milan (from 2002 to 2011). 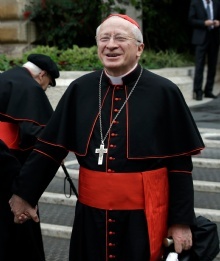 He was appointed Cardinal in 2003. He is born under the zodiac scorpio, who is known for Transient, Self-Willed, Purposeful, Unyielding. Our collection contains 2 quotes who is written / told by Angelo. "We show deference to the civil authorities when they respect the divine origin of their power and when they serve the people with objective reference to the law of God"
"It's very difficult to determine whether this is the fault of the world that has abandoned the Church, or the Church that does not know how to relate to the world"